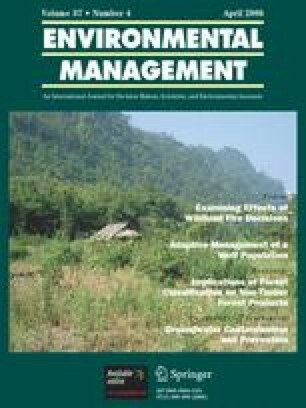 Forested riparian corridors are thought to minimize impacts of landscape disturbance on stream ecosystems; yet, the effectiveness of streamside forests in mitigating disturbance in urbanizing catchments is unknown. We expected that riparian forests would provide minimal benefits for fish assemblages in streams that are highly impaired by sediment or hydrologic alteration. We tested this hypothesis in 30 small streams along a gradient of urban disturbance (1–65% urban land cover). Species expected to be sensitive to disturbance (i.e., fluvial specialists and “sensitive” species that respond negatively to urbanization) were best predicted by models including percent forest cover in the riparian corridor and a principal components axis describing sediment disturbance. Only sites with coarse bed sediment and low bed mobility (vs. sites with high amounts of fine sediment) had increased richness and abundances of sensitive species with higher percent riparian forests, supporting our hypothesis that response to riparian forests is contingent on the sediment regime. Abundances of Etheostoma scotti, the federally threatened Cherokee darter, were best predicted by models with single variables representing stormflow (r2 = 0.34) and sediment (r2 = 0.23) conditions. Lentic-tolerant species richness and abundance responded only to a variable representing prolonged duration of low-flow conditions. For these species, hydrologic alteration overwhelmed any influence of riparian forests on stream biota. These results suggest that, at a minimum, catchment management strategies must simultaneously address hydrologic, sediment, and riparian disturbance in order to protect all aspects of fish assemblage integrity. The authors thank D. Leigh for his guidance in selecting geomorphic variables and determining sampling methods and for assistance with HEC-RAS analyses. We thank P. Benton, C. Landress, R. Reese, and D. Sickbert, from Kennesaw State University, and R. Coleman, W. Duncan, R. Machousky, P. Marcinek, J. Megley, J. Rodgers, and J. Shields, from the University of Georgia, for assisting with collection of habitat and slope measurements. J. Lee and E. Kramer from the Natural Resources Spatial Analysis Laboratory at the University of Georgia provided landcover and impervious-surface-cover maps. Funding for this project was provided by a US Fish & Wildlife Service Habitat Conservation Planning grant awarded to the Georgia Department of Natural Resources and by a University of Georgia Dissertation Writing Fellowship awarded to AHR.